Polyfoam tunic is bright red and says Ketchup! You know what goes well with just about anything? If you were thinking Ketchup then you're right! People put it on top of their juicy cheeseburgers or perfectly grilled hot dogs. They dip their crispy fries and tender chicken nuggets into it. Some people even go as far as to mix it in with their scrambled eggs! Crazy, right? But whatever makes your boat float, we don't judge. Your kiddo sure seems to carry the essence of ketchup with her. Not that she's salty or anything, but she seems like someone who gets along with just about anyone. So why not, for Halloween, dressing her up as her condiment-counterpart? Grab this Child Ketchup Costume and your little one will be the cutest bottle of table sauce that anybody ever did see! This easy to slip on tunic is bright red and has KETCHUP proudly printed across it. No one will mistake your tiny tot for Tabasco sauce or some other lesser red condiment, not with this tunic! Also, the headpiece perfectly resembles a ketchup bottle nozzle. You can have the whole family go out this year in kitchen or restaurant themed outfits and your little one can be the zesty ketchup that kicks everything up a notch! Muster the entire family together and relish another amazing Halloween! 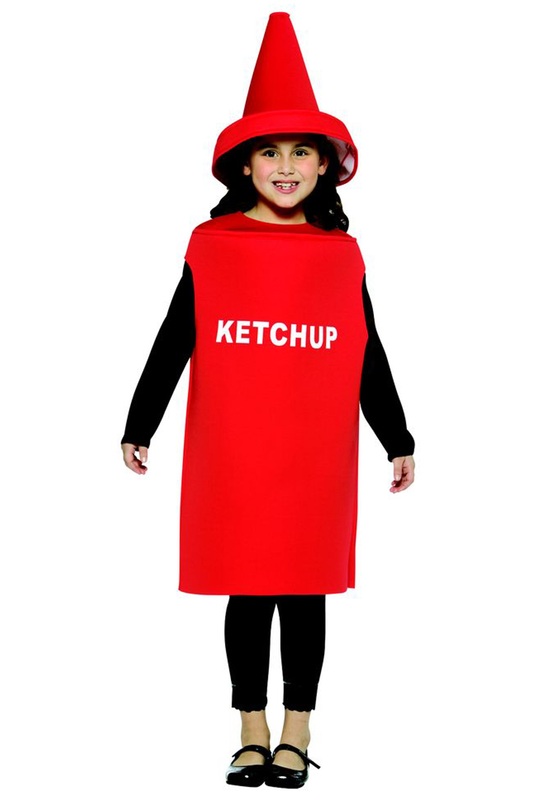 Everyone loves ketchup and when they see your little girl dressed up in this adorable costume, they'll be all smiles. Make sure to take plenty of pictures to capture every precious moment of your catsup cutie!